How to get to Coquimbo? The plaza lies in calle Aldunate (no number), close to the ancient cerro La Cruz. Today it is the main meeting point for the people of Coquimbo. In front of this plaza you will find the San Pedro Church which dates from 1862, site of the earliest parish church of the city, founded in 1857. Located at Nº 999 calle Aldunate, on the corner of Lastra. This church dates from 1862, site of the earliest parish church of the city, founded in 1857. As such it was witness to the dawn of Coquimbo, since Mass was already being held there in 1844. Located at the beginning of Avenida Costanera. The port was inaugurated in 1959 and is the center of maritime and commercial movement of the ships that arrive at its breakwater, with two berths and large supporting areas of level ground. Located at Nº 715 Avenida Costanera, on the corner of Freire. This is a center which is home to recreational and cultural activities organized by the municipality of Coquimbo. It is also home to a library and a tourist information center. A beautiful and bustling maritime scene, where you will find a typical Fishing Terminal. There you can buy or taste delicious seafood. You can also take boat trips around the bay. The O’Higgins park is located nearby. Reached via calle Regimiento Coquimbo. A footpath that winds its way through the hills takes you to Punta Pelícanos, from where there is a spectacular view of the bay. Here you will find an ancient cannon dating from 1868, brought there by Carlos Lambert to defend the port during the War of the Pacific. The Punta de Tortuga Lighthouse, inaugurated in 1868, is located nearby, vital for the navigation of seafarers. 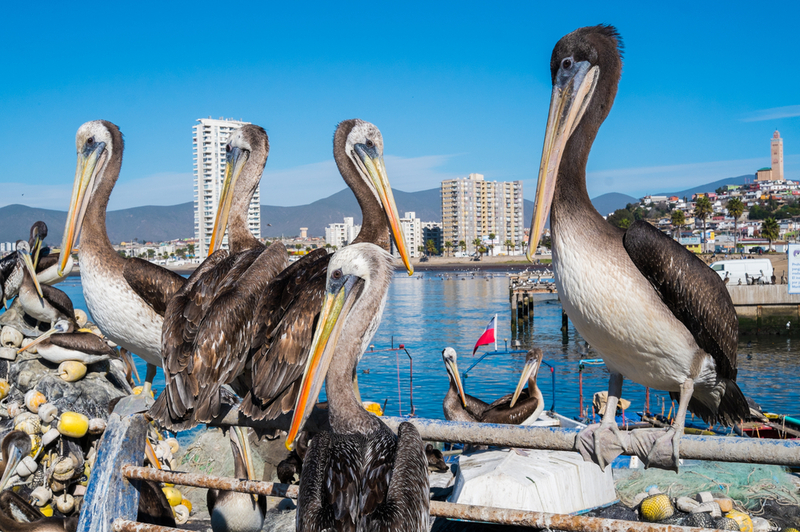 This bay is situated next to the Port of Coquimbo, part of the urban development. The Port of Guayatán, settlement of the first inhabitants of the region, is located here, where you can visit the metal Church designed by the French architect Eiffel at the request of José Tomás de Urmeneta, member of the Foundation of Guayacán, in 1889. The English Cemetery is another interesting place, built in 1860 during the peak of the mining industry. It has beautiful gravestones and crosses imported from Europe. An area of level ground situated between hills, where the Fiestas Patrias (National Days) are celebrated on 18 and 19 September, a celebration which goes on until 20th. On this date, thousands of tents and shelters are put up, together with a stage, where musical shows are put on. You can enjoy a great view of the bay from the Mirador de los Navegantes (Viewpoint of the Seafarers). Here there is a monument built in remembrance of the seamen that set out from the coasts of the Pacific Ocean. Located on the cerro Vigía, at 157 meters above sea level, this is a place for prayer that commemorates 2,000 years since the birth of Christ. This is the highest construction in the country and is made up of 3 pillars, from which the cross is raised. The structure is made out of reinforced concrete and represents the fundamental symbols of Christianity and Divinity, expressed by the base, which is an equilateral triangle. On top of the base are three columns representing the Holy Trinity, with the cross on top, and which reach 93 meters at their highest point. On the second level you will find the Plaza of Prayer, which can hold 1,500 people. On the third level there are twelve pillars which represent the apostles. A long beach that runs to the Avenida del Mar in La Serena, originating from the Avenida Costanera in Coquimbo. The sea here is suitable for swimming and water sports. Amongst the attractions here is a Casino, a riding club and an exhibition enclosure.